…you’re looking in the wrong place. …spontaneously reorganize themselves in new ways. This universe contains two kinds of systems: open and closed. Closed systems eventually fall apart. Disorder and chaos overwhelms them. Open systems, though, evolve and grow by exchanging energy with their environment. Matter and energy flow in, energy exchanges happen, and entropy (waste products) flow out. Disorder, though created, doesn’t undo them, because open systems export it to their environment. Open systems, in fact, become more ordered. They adapt. You, for instance, easily handle a wide range of situations—sights, sounds, people, events, weather changes, foods, news, and other outcomes—usually without skipping a beat. Occasionally, though, life overwhelms you. You feel chaotic. You might even feel like you’re falling apart. Until recently, scientists saw the instability of open systems as a negative. Please, they pleaded—just follow Newton’s simple, linear, stimulus/response laws. Open systems, though, are incredibly complex, often with infinite variables—and an infinite number of possible responses. For many years they were just too complex to study. Then, Belgian-born scientist Ilya Prigogine saw something no one else had seen, winning the 1977 Noble Prize for Chemistry. Yes, he said, open systems are unstable—but they’re also fertile and creative, a source of order and evolution—and even life itself. …increasing their ability to export entropy to their environment. You are an open system. You take in energy and matter. You convert it to heat, growth, motion, thinking, and creativity. This creates entropy, disorder. Being an open system, though, you export it to the environment (as carbon dioxide, heat, other waste products, etc). To exist as an open system you need two things: a continuous input of matter and energy, and the continuous export of the resulting entropy. 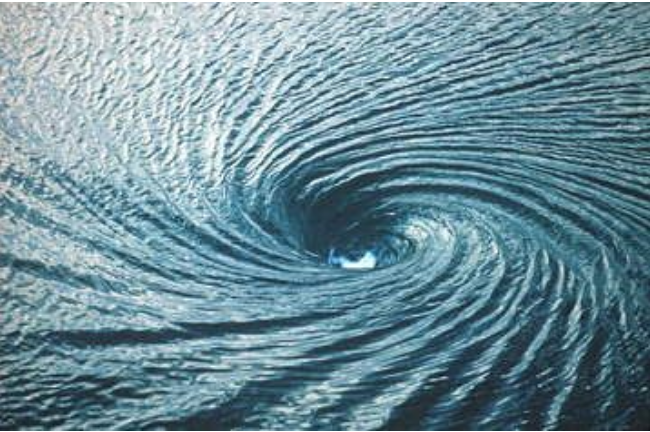 Living things die if either of these fail to happen—just as a whirlpool collapses if water stops coming in at the top or exiting at the bottom. The first is that the system totally falls apart. This is bad enough, but it’s the second possibility that will really blow your mind. What is the second possibility? No one knows. Why? Because at the point where the system can no longer sustain itself (what scientists call a bifurcation point) there are an infinite number of possibilities—and none are predetermined! These infinite possibilities are arranged in a bell curve of probabilities—with the most probable in the center and the less probably toward the edges. No one knows which will win—until it happens. One is the death of the system. All the other (infinite) possibilities, though, involve the old system reorganizing itself in an entirely new way. • First, the new system is more complex—and more ordered—than the old system. • Second, the new system can handle the input the old system could not handle! Why? Because each of the possible outcomes (other than system death) involves a greater ability to export entropy. Folks, this is an explanation of how the universe was created and continues to evolve. …the development of cancer cells, how behavior changes happen, the development of philosophical systems, how art is created, and much, much more. Finally, in the next issue, I’ll explain how all of this applies to your mental, emotional, spiritual, and physical health—and how our natural human resistance to this universal process holds us back and creates much of human suffering. This final installment, I promise, will give you an entirely new perspective on life and how to successfully navigate it. The smartest people in the world all have something in common: they know where to find the information they need. And finding the right information is all about asking the right questions. This is why the most successful people in the world strongly advocate finding a mentor–because a mentor knows the right questions to ask. A few days ago, I received a book in the mail written by a 20+ year user of Holosync, Reed Daugherity. His book–Passionate Purpose–was written to help you find your purpose in life, and I think it does an excellent job. Why? Because Reed’s book asks the right questions. Passionate Purpose has twelve sections, each designed to help you answer a specific, big-picture question related to finding your purpose in life. Each of these big-picture questions is broken up into a series of smaller questions to keep you on the path to a solution (there is even space to write answers in the book). Now, Reed told me that only has a few copies of this book left, and because he’s moving on to other projects, he doesn’t plan to print more. If you’ve been struggling to find a purpose in life, I highly recommend you read this book. It really will help you. But hurry, because he only has a few hundred copies left and I’ve sent this to several hundred thousand people. You can get a copy from Reed’s website http://passionate-purpose.com. If you’d like to get really clear about your purpose in life, do get a copy. Click here to get one of the few remaining copies. Do you want to stop procrastinating and increase your productivity? If so, I suggest you set deadlines, both short-term and long-term. For larger projects, set a firm deadline (“I will finish this before X date”), then determine what you’ll need to do to meet that deadline. In other words, break the large project into several smaller projects. Then, when you begin each smaller project, set a timer (for 20-30 minutes, or about how long it will take you to complete the task). Deadlines like these provide a sense of urgency. The sense of urgency that comes with a last-minute deadline provides just enough adrenaline to overcome boredom and begin a task. The classic example of this adrenaline-fueled boost is the student who waits until the night before an assignment is due to begin. Use this knowledge to your advantage by setting deadlines for yourself and creating a sense of urgency. ”I started the Centerpointe program in 2009 and seven years later I still follow the program with 100% commitment. The program has been a positive life changing experience for me personally. I recommend this program to anyone who is sick of doctors and their rubbish pills for sufferers of insomnia, depression, anxiety and stress, brought on by either work, family or friendship relationships. Want to see your story in print, like Erica’s? Click on the button below and tell us your story. Hi to every one, because I am really eager of reading this blog’s post to be updated on a regular basis.